New Products and procedures are giving dermatology – and its patients – a new look. 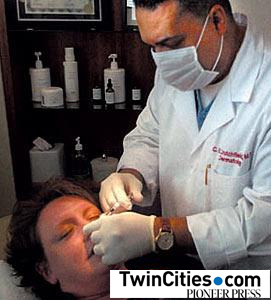 Dr. Charles Crutchfield performs a "lunchtime nose job" to smooth out a scar on the tip of Jolie Anderson's nose. At lunchtime, most people think about going out for a sandwich or a salad. . But a mini-facelift? Or a nose job? Those are on the menu now, too. Clinics like Crutchfield Dermatology in Eagan offer a "lunchtime lift," a 45-minute facial that doubles as a facelift good for up to a week. And the clinic's "lunchtime nose job" is a more permanent fix to change the shape of a nose. Robyn Makousky, a real estate closer, zips in to the clinic every few months from her Minneapolis office to smooth her skin. Her philosophy: "You've got to feel good about yourself." Jolie Anderson of Lakeville used her lunch break recently for the nose treatment. She was excited about the prospect of erasing a deep scar at the tip of her nose that made her feel self-conscious. "I'm not a vain person," says the 32-year-old mother of three. "But when I look at my face, this is what I see," she says, putting a finger to her nose. Dr. Charles Crutchfield III created the lunchtime labels at his clinic to call attention to newer cosmetic techniques in the dermatology industry. About one in five patients who come to the bustling clinic — appointed with fresh flowers, gentle music and spa-type treatment rooms — come for a cosmetic procedure, he says. "People used to think a procedure was either for medical reasons or cosmetic reasons," Crutchfield says. "But that line has blurred." Most people think facelifts and nose jobs are the exclusive turf of plastic surgeons, and there are big differences between surgery and minimally invasive procedures like the lunchtime facial and nose job. Dermatologists always have focused on making people's skin look good, Crutchfield says. And new products are continually expanding the possibilities for people who want to enhance appearance. The quickie nose job relies on a tiny needle and a filling agent called Restylane injected into the skin to change the nose's contour or fill a surface defect. The filler is made of a sugar-based liquid naturally found in human skin and joints. The cost of his nose job is $300 to $700, depending on the number of treatments required — usually two to four. Because Restylane is a filler, it can't make a big nose smaller. That's a job left to the plastic surgeons. A severe case of acne during pregnancy left a scar on Anderson's nose. Her obstetrician referred her to Crutchfield's clinic. After the half-hour procedure, Crutchfield gauged the result to be "about 35 percent" of what he expects after three more treatments he recommended. His patient raved about the results. And on the drive back to her office, Anderson stopped for fast food to eat at her desk at nearby Thomson Co., where she works as a project manager. Makousky likes the Javani facial — it uses microdermabrasion to re-move dead skin cells and ultrasound massage to hy-drate and rejuvenate the skin. Cost for a treatment is $199. She also uses a cream to keep the skin looking plump and smooth longer than a week. "A lot of people have the facial before a cocktail party, a class reunion or a wedding," Crutchfield says. "Some will do it on a Friday. It looks great all weekend." Makousky has had at least a half-dozen since hearing about them from her daughter, an aesthetician at the clinic. The treatments have lightened brown spots caused by sun damage on her face that makeup doesn't camouflage. "I still have some of the spots, but they're nothing like they were," says Makousky, 52, of Richfield. "Now, I can cover them with makeup." She likes the feel of her face after a treatment. "It feels fabulous. No dry skin. No dead skin. It feels bright and fresh." There's another thing she likes about the procedure, too, she says. "You don't have to do it over a lunch hour." Her typical appointment is at 5 p.m.
Kay Harvey can be reached at kharvey@pioneerpress.com or 651-228-5468. See for yourself: Patients' before and after photos are posted at www.CrutchfieldDermatology.com.